Sunair has bowed out of single-engined aircraft operations with Cessna 172 ZK-DHN being sold earlier this month. Originair flights today are again being operated by Napier's Skyline Aviation. On duty today is Beech Super King Air ZK-MFT, with callsign SKY 8. Since the grounding of the Jetstreams' operator air2there Originair have employed Air Chathams (using Metro 23 ZK-POF), Air Wanganui (using Beech Super King Air ZK-MDC and Beech King Air ZK-MKG) and Skyline Aviation (using Cessna 510 Mustang ZK-YDZ and Beech Super King Air ZK-MFT) to maintain their services. Meanwhile Originair's BAe Jetstream 31 ZK-JSH's 'ownership' on the CAA civil aircraft register has passed from air2there back to Originair on 25 November 2018. Regional airline Air2there based in the lower North Island has been placed into receivership and a Piper Navajo plane and two engines have been seized. The company was set up in 2004 as a city hopper service based at Paraparaumu flying small aeroplanes between Wellington, Masterton, Blenheim and Palmerston North. Its clients included the Department of Corrections transferring prisoners, Life Flight Trust's medical patients, SPCA puppies, Air Force personnel, and even coffins. Company owner since 2008, Richard Baldwin, could not be contacted but aviation consultant Irene King understood the company had lost its aviation operating certificate some weeks ago. The companies placed into receivership included Air Wellington and Kingair. Receiver John Fisk of PricewaterhouseCoopers said he had yet to identify all debts but expected they would run into millions of dollars. Meanwhile, King said it was difficult to recover from a suspension by Civil Aviation Authority. "It happened to Sun Air in Tauranga earlier this year and took months and thousands of hours of work to get them back in the air. We knew the company well and CAA's concerns didn't square with our experience of that company. "It used to cost about $6000 to $12,000 but now it's between $35,000 and $40,000 to get an aviation operating certificate. "These little companies can't survive under the regulatory cost pressure. I'd say you need up to $3.5 million in your hip pocket to operate now. "The supply of pilots is really tricky for these airlines too." King said it wasn't a question of competence at CAA but rather its own lack of resources and the priorities it had to deal with, such as Air New Zealand's new fleet. "The CAA Act puts enormous power in the hands of the regulator and when it loses confidence in a company it's extremely hard to restore. You really need a third player that can bring the parties together. It's not so much the physical or engineering safety. It's more about the management of system controls." 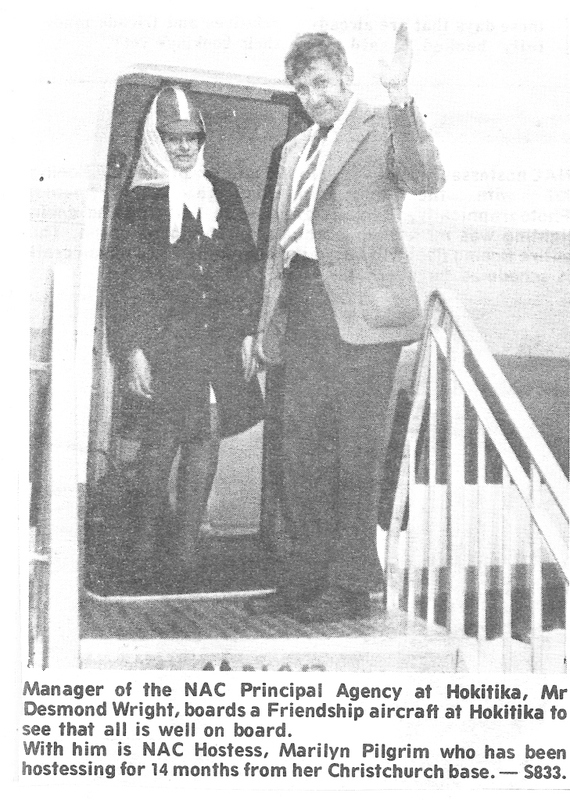 King said the services carried out by Air2there would have been relatively easily picked up by other operators such as Sounds Air which flew some similar routes over Cook Strait. Company owner Richard Baldwin was also the Paraparaumu airport manager when he bought the company in 2008. It had been using his Piper Navajo for two years. With internet ticketing, people wanting to travel between the five centres could walk onto the aircraft with minimal waiting time at either end. Air2there faced new competition from late January 2015 when Sounds Air introduced thrice daily weekday flights between Paraparaumu and Blenheim. Sounds Air didn't pick up the traffic it anticipated and reduced its schedule. Air2there's last flights took place in September or October. What about the Caravan and Beech Super King Air? I had heard the rumours of losing the Air Operating Certificate. But no real information was given here. What was the story? ...but in the end I feel the article actually nuddies the waters. The speculation is finally over... Air2there.Com (2008) Limited. Air Wellington Limited and Kingair Limited were all placed in receivership today, a sad end for all involved. Air Napier has changed hands with Gary Peacock selling the Napier-based airline to Shahnawaz Aslam on 2 November 2018. Air Napier currently has one scheduled service, a courier run from Napier to Gisborne that operates Tuesday to Saturday and Gisborne to Napier on Monday to Friday. The airline has a Piper Navajo, three Piper Senecas and a Piper Cherokee 6. The company now has a new website and its own Facebook where it was stated, "We have some big plans for the future to help better connect the region for both freight and passengers." All the best to the Shah and to Gary! This blog started in late 2009 when someone asked me a question about a 3rd level airline from the past and I couldn't remember the facts. I researched my files and couldn't come up with the answer and to did elsewhere to finally find the answer. However, it really struck me that today's news is tomorrow's history and how important it is to keep a record of things. My interest in the airlines had started growing up in Hokitika watching the DC-3s, Dominies and later Friendships and Cessna 185s flying past our house on approach to or departure from Hokitika Airport. One of my favourite airline profiles is on the South Westland ski plane service between Hokitika and the Glaciers... http://3rdlevelnz.blogspot.com/2013/03/south-westland-skiplane-air-service.html. I had remembered this service as a kid, and watching the Friendship go to Christchurch, the DC-3 to Westport and the skiplane to the Glaciers. Not much was ever written on the service and so it was a great project to be able to amass quite a bit of information on in. Even now I still am getting more information. I started taking pictures of aircraft while at High School and was taught fairly quickly by Ian Coates from Greymouth to make sure I included the registration and recorded the date. 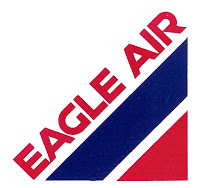 About this time I started collecting timetables from the local travel agent Des Wright - though later I made the fatal mistake, when moving, of throwing them out including Capital Air Services, Air North and Nationwide Air timetables. In my early years working I started doing some scrap books of 3rd level news. It was easy when working for the Forest Service in Hokitika as the library was close and in those days the library carried most of New Zealand's regional newspapers. However, it was meeting Bruce Gavin from Matamata that really focussed me on my interest in the domestic airlines and keeping something of their history. 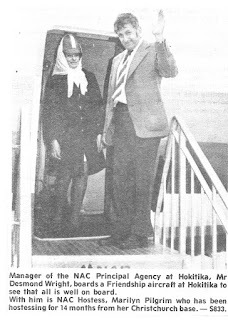 Bruce has probably documented the history of the NZ 3rd level airlines more thoroughly than any other person in the country with his research going back over 50 years. He continues to be a real source of information and inspiration to me. Times change and after some years I dumped the scrapbooks, scanning all the newspaper clippings from them into Word on the computer. Since then this has been my habit. 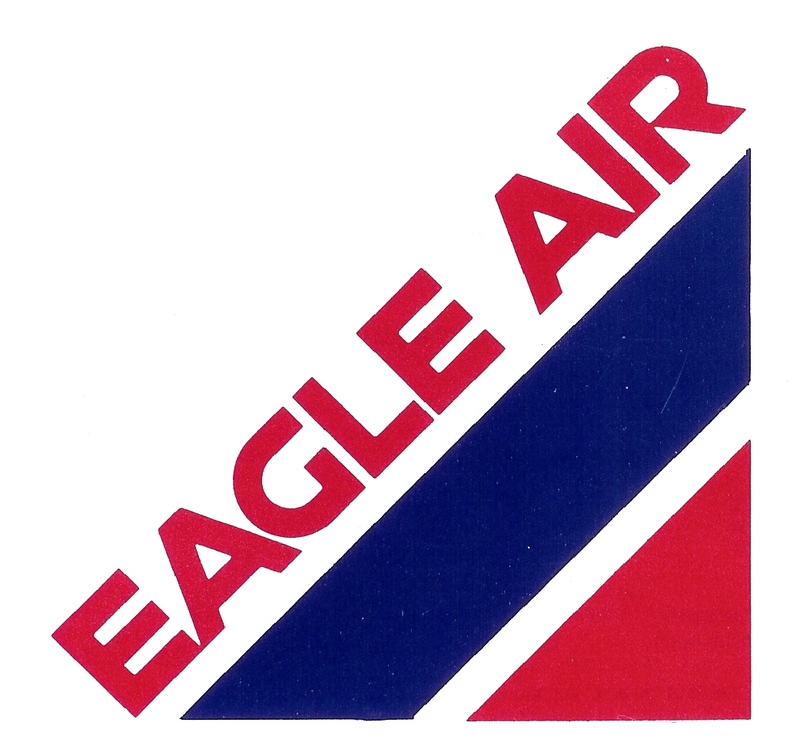 So, for example, my file on Air Chathams is 102 A4 pages long and the Eagle Air one is 321 pages long! And they are both still growing as I find other pieces of information! These days the sources of information are changing. Newspapers are dying and certainly the smaller airlines rarely feature unless there is some catastrophe! Printed timetables are more and more a thing of the past. On the plus side, however, social media and the company websites give information. But often now there are so many social media sites with snippets of news and it is easy to miss these. A big help is when someone sends an email with a tip off on news or sends in imformation about contemporary airline news or more information, corrections or photos on my airline profiles. 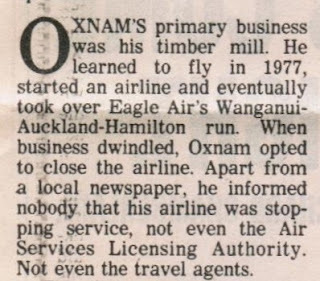 All this helps paint the story (or history) of New Zealand's 3rd level airlines. By holding it up to the light I could read additional flights on a Wednesday and by cut and paste in Photoshop I could recreate what the timetable looked like. In this case my specualation of this undated timetable is that after the Foxpine Air Charter Seneca crashed in May 1988 operating the Air River City service between Auckland, Hamilton and Wanganui, Air Wanganui trialled a twice daily morning and business service between Auckland and Hamilton. The service didn't last as I have a timetable from 1989 and it was not included. ...so I can see at some point I need to get to Wanganui to find out what was in the local newspaper about the service stopping... I guess it will be somewhere from late April to early May 1988. Can I take this opportunity to thank all those who read this blog and have supported it with info, photos and encouragement! Operating Originair's flights yesterday was Skyline Aviation's Cessna 510 Mustang ZK-YDZ. The jet operated Nelson-New Plymouth-Napier and the return Napier-New Plymouth-Nelson. The jet then operated two Nelson-Palmerston North-Nelson services. This would be, from my reckoning, the first time a New Zealand third level/regional operator has used jet equipment. A small airline which failed to book any passengers on its inaugural flight into Whangārei recently has since picked up business and may even add extra flights. Fly My Sky first flew from Auckland to Whangārei on the morning of October 29 with only its chief executive Keith McKenzie and Whangārei MP Dr Shane Reti on board. The return flight on its 10-seater Britten Norman Islander twin-engine plane had one passenger. The airline flies into Whangārei twice daily from Monday to Friday, with a one-way fare of $99 including 23kg luggage. McKenzie said the number of passengers were starting to build up and he expected it to increase heading into the busy festive season. "It's very encouraging. We offer flight times that suit people, particularly the early afternoon ones that means passengers avoid the afternoon traffic rush in Auckland and in Whangārei," he said. "The lightest flights are those departing Auckland at 6.55am and leaving Whangārei at 8.25am but the one leaving Whangārei at 2.50pm and arriving into Auckland at 3.30pm is popular. "So we're slowly building up and we expect as the time goes by that more people who fly with us talk to family and friends and it will build up from there. Flights to and from Whangārei are cheaper than doing a scenic flight over Auckland," he said. McKenzie said the company would look early next year whether to increase Auckland to Whangārei flights. 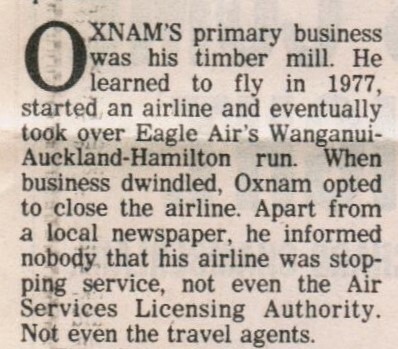 He was unfazed at a lack of booking during its inaugural flight to Whangārei and blamed it on a lack of advertising. I'm hoping to try the service before Christmas myself! There has been a second application to put air2there.com (2008) Ltd into liquidation. On the 13th of November 2018, the Marlborough Airport Limited filed papers in the High Court at Wellington to this effect. The case will be heard on the 4th of December. A previous application was filed on the 25th of September 2018 by Nelson Airport Ltd with the case heard on the 6th of November. Air2there's Beech Super King Air was last flown on the 10th of September and Originair's Jetstreams, which were operated by air2there were last used on the 12th of September. The airline has not operated its Paraparaumu-Blenheim-Nelson-Paraparaumu triangle since June this year when it was flown using the Jetstreams. Air2there's Cessna Caravan ZK-MYH is currently for sale. The company's website was been down for close to a month now. Air Chathams celebrated three months of flying to and from the Kāpiti Coast yesterday. More than 13,000 people have flown in and out of Kāpiti with Air Chathams in the past 90 days. More and more frequently the early morning service to Auckland and return evening service to Paraparaumu are full. It takes a time to build a comprehensive service such as Air Chathams have introduced and they have been seen to do this successfully in Whakatane and Whanganui and not all the flights are as popular as the peak time flights. As Air Chathams build the Kāpiti air service up Metroliners, instead of the Saab, are going to be used on the morning flight, 3C 640 to Paraparaumu, which departs Auckland at 9.30am and the return flight, 3C 647 to Auckland, which departs Paraparaumu at 11.00am. The revised Metroliner schedule started yesterday. 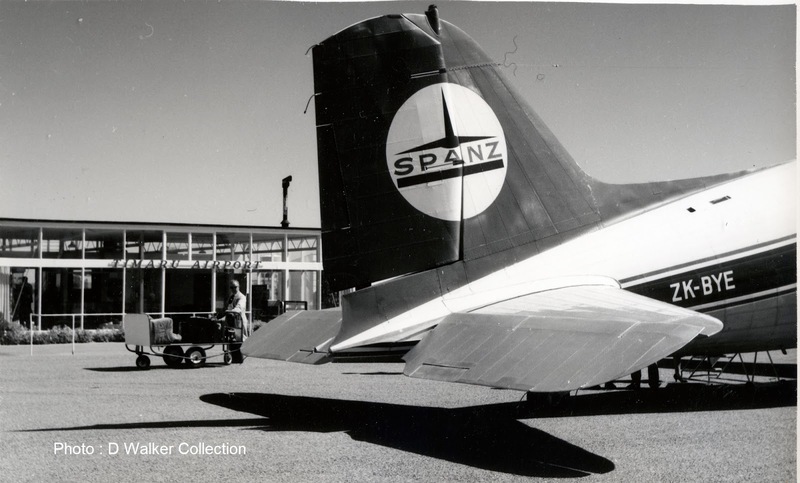 Timaru was a port for three DC-3 operators, NAC, SPANZ and Mount Cook Airlines. This is a glimpse of some of DC-3s in Timaru... 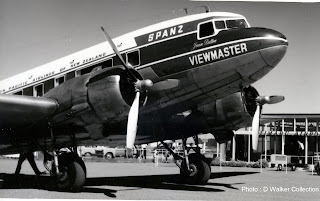 I haven't written a detailed history of the Timaru services but as Timaru was usually linked with Oamaru I have included the links to the histories I have done on the Oamaru DC-3 services. 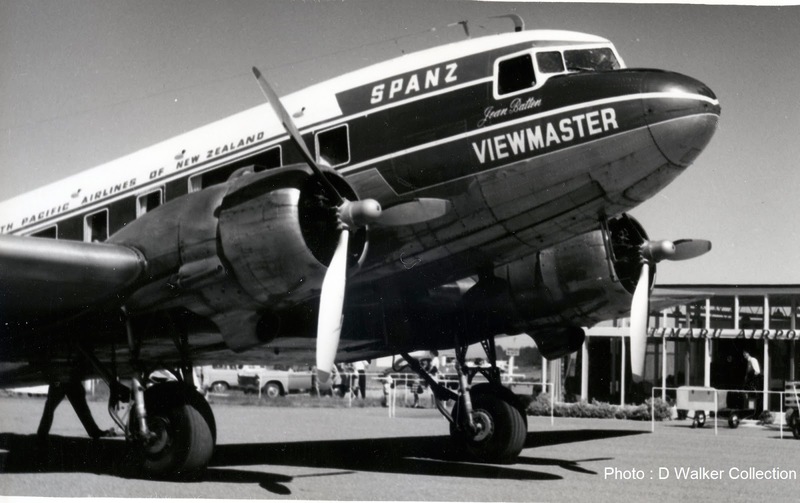 NAC's last DC-3 service was operated by ZK-AOF pictured from Christchurch to Timaru and Oamaru until July 1974.